Funny in the sense of ‘peculiar’. And sometimes funny in the sense of ‘not funny at all’. They’re just (usually squiggly) lines on a map. Artificial, squiggly lines, by and large. Created almost at random, by geography, by prehistoric tribal areas, by war, by shifting royal alliances, or by the straight, ruled lines of an administrator’s pen. There’s often no good reason why they cut through one field, rather than the one next door. And there’s usually no significant difference between the people on one side and the people on the other. But then we, our governments, and our media define ourselves against (and it’s pretty much always against) the people on the other side of the imaginary line. We are good. ‘They’ are bad. Our religion is right. ‘Theirs’ is wrong. We go overseas to work. ‘They’ come here to steal our jobs. We retire abroad. ‘They’ sponge off our healthcare system. ‘They’ need to be controlled, or we’ll be ‘swamped’ by a ‘swarm’. So we build the borders higher, and wonder why desperate people turn to smugglers to help them escape from death or persecution. ‘They’ must be stupid, too, mustn’t they? And we scratch our heads in puzzlement, and watch ‘them’ die against our fences. For years. As you can probably tell, riding long distances on a bike can give you a bit too much time to think. Thankfully, the border I was concerned with as I rolled out of Bristol was the border between England and Wales. It’s been around pretty much since the Romans left Britain, which is quite a while. The Anglo-Saxons, the English and the Welsh have all fortified chunks of it over the years. And its history is just as messy as any other border. Hundreds of years of keeping ‘them’ out of England. Violently. But the last couple of centuries have been a bit quieter. Straight over the Severn Estuary from Bristol, you hit the Wye valley. It’s a steep, beautiful river valley, with England on one bank and Wales on the other. 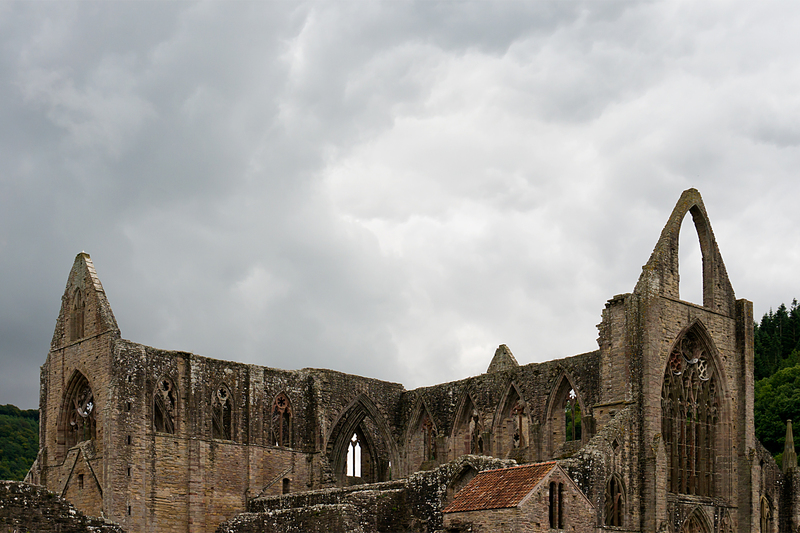 The ruins of Tintern Abbey (above) dominate the Welsh side at the southern end of the valley. And sometimes, I only noticed that I’d swapped countries again when I saw the word ‘SLOW’ painted on the road. If it just said ‘SLOW’, I was in England. If it said ‘ARAF’ too, I was in Wales. It’s bilingual, so I know I’m in Wales. 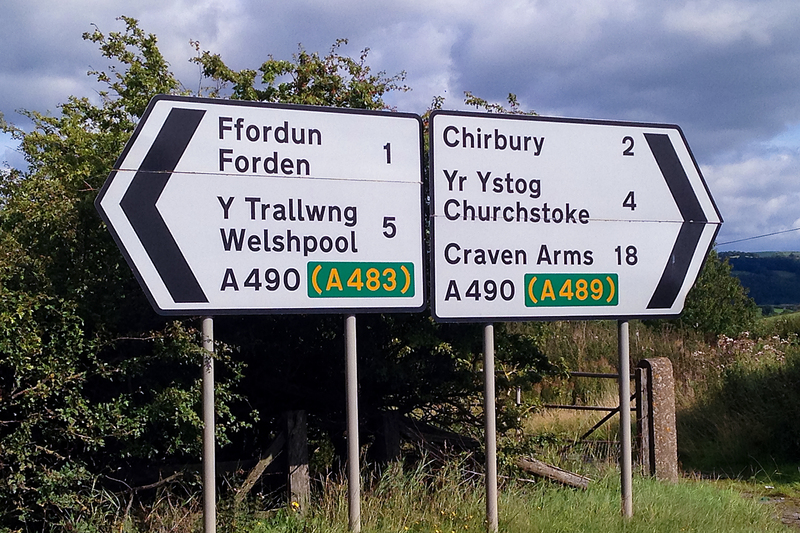 Chirbury (2 miles down the road) is in England. Church Stoke (another 2 miles down the road) is in Wales again. I think that’s right, anyway. 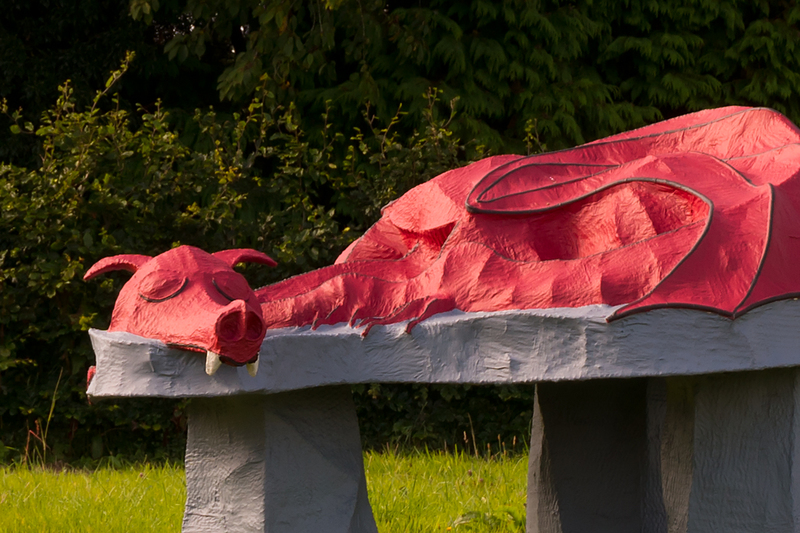 After Welshpool, I headed into North Wales (or at least, in and out of North Wales). The hills had levelled out, as I was avoiding beautiful Snowdonia, where the big Welsh mountains are. But there was one more hill I had to climb before I left Wales. Because I wanted to see the canal boats in the sky. I’ve come to the unexpected conclusion that there aren’t enough aqueducts in the world. Many of those that do exist just move water from one place to another. 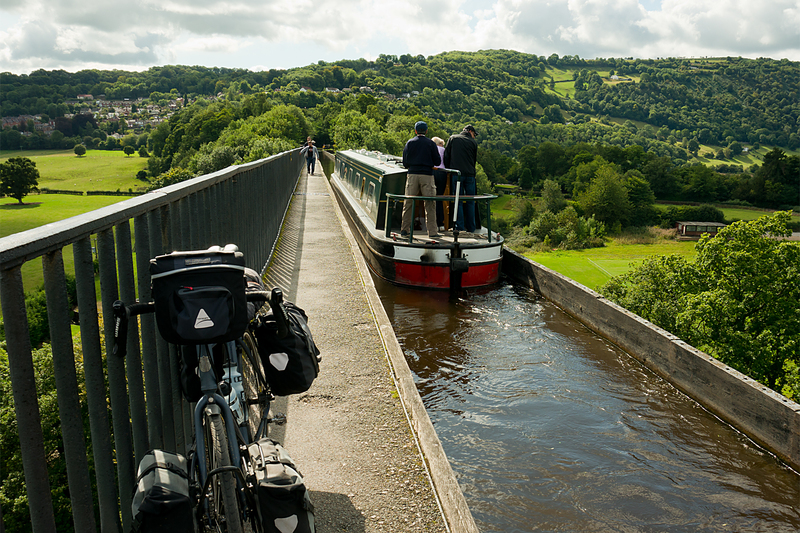 But the Pontcysyllte aqueduct is a little more ambitious. It takes boats across a valley. A couple of hundred feet in the air. Over a river. Well worth the detour. After the excitement of the aqueduct (boats go across it as fast as 2 mph! ), it was back to the flatlands. 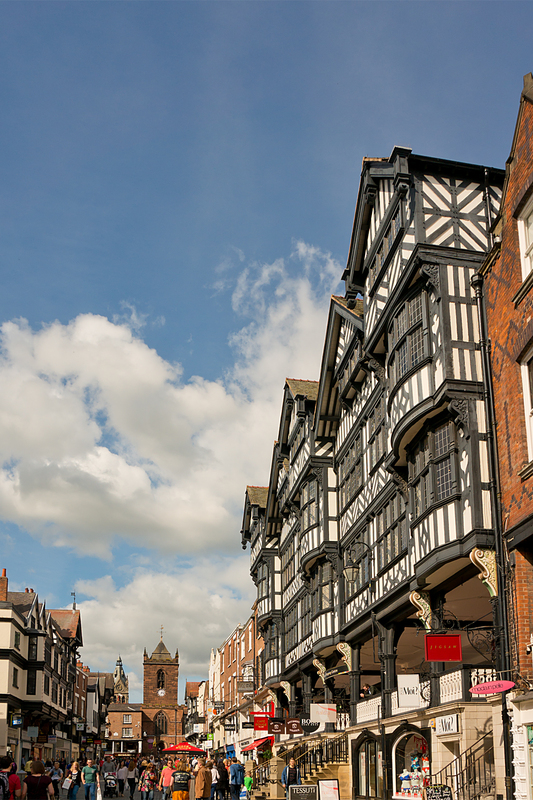 A quick nip through Chester, which was once a Roman fort, for controlling the Welsh border. And a pause to appreciate what’s reckoned to be the world’s first ‘indoor shopping centre’ (note the medieval covered galleries on the buildings, to enable the wealthy shoppers to avoid the toilet buckets thrown from the upper storeys. And the rain of course). At this point, I was only a few tens of miles from finishing the English section of the tour. It was nearly time to depart the UK for a couple of days. I just had the flattest day so far, across the plains of Lancashire, to go. 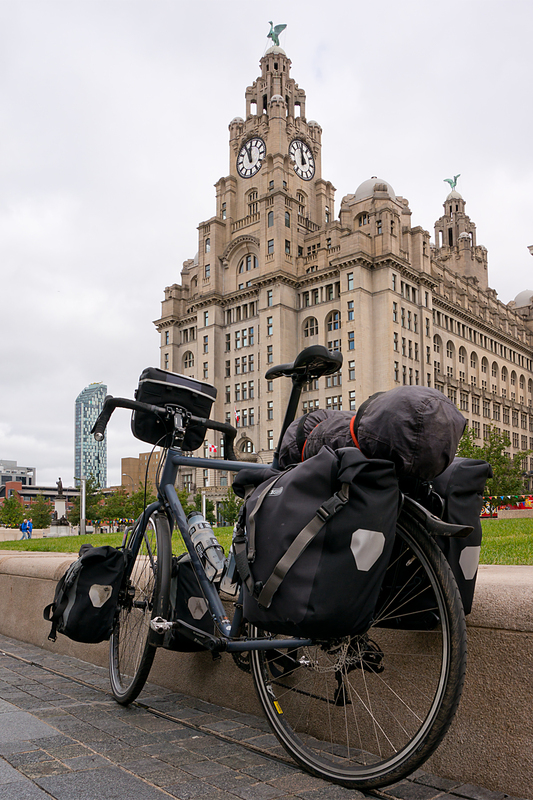 Liverpool is only a few miles up the road from Chester, and I trundled up the Wirral peninsular to take the ferry across the river into town on Sunday morning. As you’d expect, no clichés were spared; The Beatles were playing on loop in the cafe while I waited for the boat to arrive, and they managed to play ‘Ferry ‘cross the Mersey’ twice over the PA on the boat during the short crossing. I’d not really seen much of central Liverpool before, but the waterfront, which saw so many migrants depart from Europe (that’s right – hundreds of thousands of migrants leaving Europe; who’d have thought?) for Canada and the US, is really impressive. And the city was quiet as I headed north across the flat lands for Lancaster. Another Roman city, this time with one eye aimed at the Scottish rather than the Welsh. The last major Roman outpost before Carlisle, which sits right on the border of the Roman empire at Hadrian’s Wall. It’s a bit of a shame that my route takes me away from there, and the Lake District national park between them. But there’s new stuff to see, and I’ve been there before. And so it was that I set sail yesterday, leaving England behind. And leaving the UK behind, temporarily. 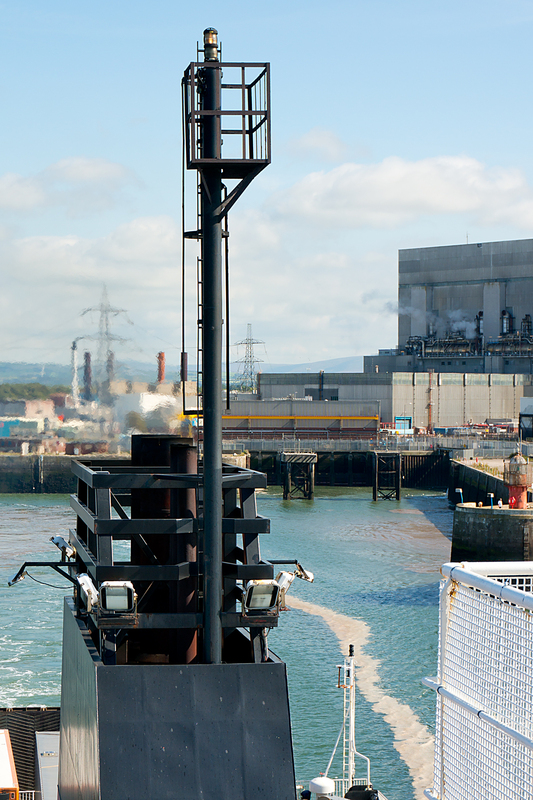 A short ride from Lancaster brings you to the small port of Heysham. Journey’s end for the English and Welsh section of the ride. 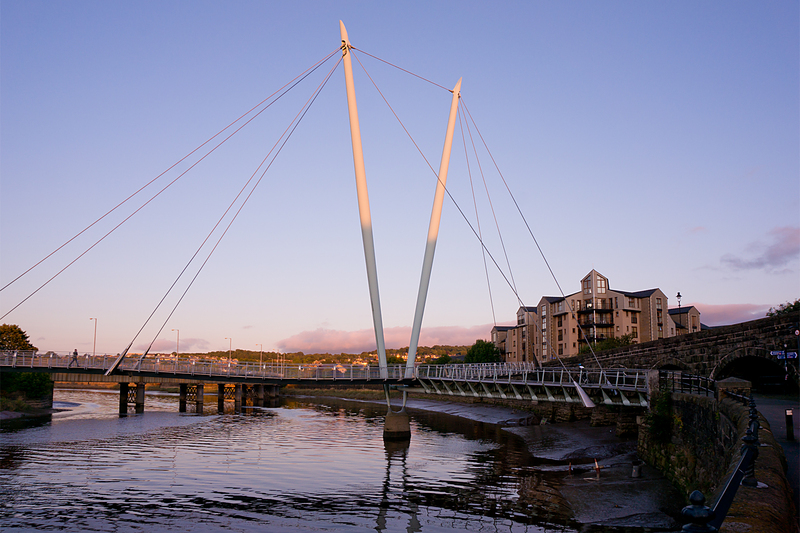 To the north of the port, you get stunning views across the bay to the Lake District. To the south you get nuclear power stations. Lovely. Across the water to the west are new places for me to explore. Tomorrow (Weds), I’m on an early boat to Northern Ireland. For today, I’m offshore on the Isle of Man. Same language, same accents, same buildings. Different money, different taxes, and a roaming mobile phone. I crossed a lot of borders on my half-way round the world trip. Lots of border guards taking things very seriously. Lots of people stuck on one side or the other because of their luck (or lack of it) in where they happened to be born. On this ride, I’ve carelessly criss-crossed a border that was fought over for centuries, and left my country without showing any ID. These are borders that don’t (at least generally) kill any more. Nobody storming the ferry or sitting desperately behind a fence peering in.